The Europa League groups are starting to take shape and after a complete third round of matches, group B is finely poised. 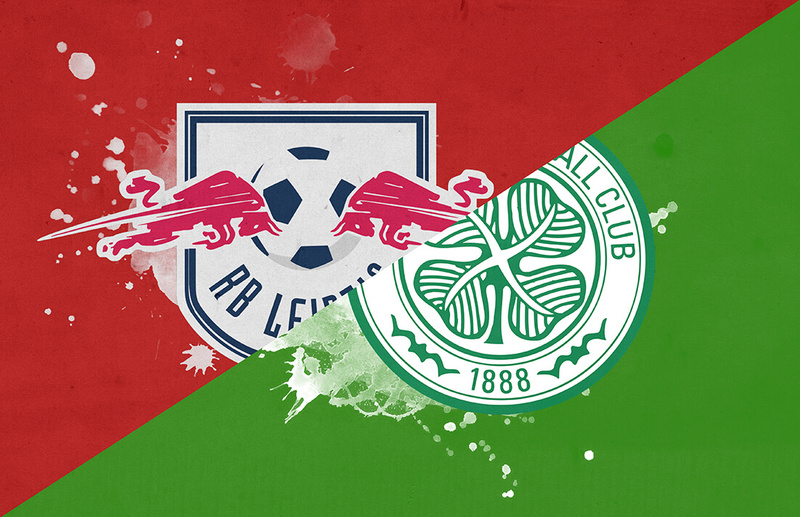 With FC Red Bull Salzburg primed to win the group, the onus is on Celtic FC and RasenBallsport Leipzig to fight it out for the second spot to qualify for the knockout rounds. Last week represented the first of the doubleheaders with RB Leipzig comfortably beating the Scottish Champions by a scoreline of 2-0. Brendan Rodgers would have hoped to come away with a point but with all still to play for, the game at Celtic Park will be vital. After losing to FC Red Bull Salzburg, Celtic FC went on to thrash St. Johnstone 6-0 away and beat Hibs 4-2 before succumbing to the East German club. RB Leipzig have been in equally good form, following up with their win against Rosenborg in the last round with a 6-0 drubbing of Nurnberg and a draw against FC Augsburg. Their form has seen them take fifth in the Bundesliga, five points behind league leaders Borussia Dortmund and one point behind Bayern Munich. RasenBallsport Leipzig lined up in a 4-3-3 formation, slightly different to their usual 4-1-2-1-2 formation with star striker Timo Werner rested and Emil Forsberg, Ibrahima Konaté and Diego Demme missing out through injury. Yussuf Poulsen was on the bench. Since their horrific defensive display against FC Salzburg, RB Leipzig have reshuffled their defence and has found stability by only conceding five goals in their last seven games. Kevin Kampl has been one of RB Leipzig’s standout performers in recent weeks with Marcel Sabitzer slowly growing his influence over the team. Both work in tandem providing a forward drive and dictating the tempo of the game for the East German side. Celtic were missing a number of players with captain Scott Brown, Tom Rogic and James Forrest missing through injury and suspension. A first win in 12 matches in Germany always looked a tall order. A rare start for Eboue Kouassi, who excelled in midfield and looked to dominate proceedings early on. They set up with a 4-3-1-2 formation with Brendan Rodgers looking to frustrate Leipzig by packing the midfield. The Scottish champions started the game brightly, putting Leipzig on the back foot stopping them from dictating play from their influential midfielders. I identified two key players to Brendan Rodgers’ side: Keiran Tierney and midfielder Eboue Kouassi. Both players were exceptional for the first 35 minutes of the game keeping RB Leipzig busy with their intelligent positioning and timely runs. Rodgers wanted to start on the front foot from minute one and force RB Leipzig back into a defensive mindset allowing his team to settle in and play with a bit more freedom. Image courtesy of Wyscout – Kieran Tierney’s heat map. Celtic forced eight Leipzig players into their own half within the first minute of the game. Five players were in advanced positions and willing to play off each other and break between the lines. Image courtesy of Wyscout – Celtic players pushing forward from minute one. Eboue Kouassi played in place of Scott Brown in midfield and impressed thoroughly. His positioning and reading of the game was impressive and he denied RB Leipzig any successful attacks early on. We can see he rarely ventured forward, he was under strict instruction to patrol his defensive third and protect the centre backs. Image courtesy of Wyscout – Eboue Kouassi’s average position heat map. One such instance of Eboue’s impressive contribution was his positional sense in the defensive third. As we can see here Callum McGregor goes to close down Lukas Klostermann to prevent the cross but Eboue recognises the danger of Jean-Kévin Augustin, gambling on the cross from the fullback. The potent forward could have possibly had enough space in front of the two centre-backs to get a shot away but quick thinking from the midfielder blocked off any potential attack. Klostermann manages to get the cross in but is blocked by the oncoming midfielder. Neither striker is proficient at heading but they thrive on quick, decisive crosses or through balls. Matheus Cunha, Bruma and Jean-Kévin Augustin are rapid strikers with good movement in and around the box. With no natural number 10 playing in the RB Leipzig starting line-up, keeping the three strikers and Kevin Kampl occupied and tracked were critical in keeping the scoreline down. Eboue was positioned as the centre of the three midfielders making him responsible for providing support to either flank. Here we can see Jean-Kévin Augustin making a run off a Marcel Sabitzer cross. Eboue’s starting position is a yard behind the Leipzig striker but manages to gain ground and diligently tracks his movement and successful thwarts the attack by blocking the oncoming shot. The Celtic players knew where to position themselves. By the end of the attack, there were seven players in the box defending in response to RB Leipzig’s four attackers. Image courtesy of Wyscout – Eboue Kouassi tracking runners diligently. The Scottish left-back was an impressive figure in the Celtic defence all evening. His movement and energy caused problems for Lukas Klostermann and Marcel Sabitzer down the left flank. RB Leipzig transformed into a narrow 4-4-2 formation without the ball to match Celtic’s 4-3-1-2. Keeping Marcel Sabitzer quiet and capitalising on his narrow positioning through Tierney was something Rodgers wanted to utilise. Celtic played the ball centrally before distributing it to their full-backs to create extra width. RB Leipzig usually play narrow formations to crowd out the opposition midfield but in this scenario, Olivier Ntcham had time and space to find the onrushing Tierney, who had acres of space to run into with Odsonne Édouard occupying the fullback. We can see Marcel Sabitzer’s narrow positioning allows for Tierney to repeat this on multiple occasions. At this point, both RB Leipzig fullbacks have been pushed back into their own halves and are not afforded the same freedom when teams focus primarily on their four midfielders. Around the 25 minute mark, Ralf Rangnick handed Kevin Kampl a note with a few tweaks and tactical changes. The first 25 minutes saw the full backs pushed wide and the midfielders playing narrow and through the middle. Rangnick instructed both Kevin Kampl and Marcel Sabitzer to move slightly wider creating an overload with Lukas Klostermann and Marcelo Saracchi. Image courtesy of Wyscout – Marcel Sabitzer & Kevin Kampl’s positioning after a change from Ralf Rangnick. This change affected both goals. The ball went out for a throw-in but instead of passing the ball inwards, Sabitzer releases a quick cross from Klostermann’s throw with neither Celtic centre-back reacting quick enough to intercept Matheus Cunha, who had enough time to settle himself and score. Image courtesy of Wyscout – Matheus Cunha’s first goal. Marcel Sabitzer is a versatile midfielder capable of playing in all four midfield positions but is best suited to a similar role played by Luka Modrić at Real Madrid. His ability to dictate the tempo of the game from the middle of the park makes him a potent outlet. He requires less space to be able to play smart passes but if the opponents are dominant on the ball or counter-attack with pace, it causes problems for the Austrian midfielder who is then dragged out of position, especially if the opposition uses their wide players as primary outlets. The versatile midfielder has a 71.8% pass accuracy rate with 3.12 dribbles per game with a 69.2% success rate. Considering the team’s strategy is to play long balls to the two strikers as a primary source of attack leaving the midfielders with second balls to play from, Sabitzer has done exceptionally well in controlling the game when his team needs to keep the ball ticking over. The pace and physicality of Timo Werner and Yussuf Poulsen allows the four midfielders to play in and around them. Kevin Kampl is more suited to the attacking role with his bursts of pace and interchanging play with the attacking midfielder and fullback. Celtic were on the front foot from the first minute and we saw the likes of Keiran Tierney take advantage of the amount of chasing the Leipzig midfielders had to do. As the game wore on and Rangnick decided to make a few tactical changes, RB Leipzig’s midfield were allowed more time on the ball and space to work with by overloading the channels, pushing the two midfielders in Kampl and Sabitzer slightly wider. Image courtesy of Wyscout – Marcel Sabitzer’s average position heat map. Image courtesy of Wyscout – Kevin Kampl’s pass to Marcelo Saracchi for the RB Leipzig’s second goal. Image courtesy of Wyscout – Marcelo Sarrachi’s cross for RB Leipzig’s second goal. Image courtesy of Wyscout – Bruma finishes the move. Notice how Sabitzer’s wider position allows him time and space to pick out Klostermann who is then able to create an opportunity for the oncoming players. The end product eventually lands at Kevin Kampl who drives in from the opposite flank making a late run into the box. In one instance we have now seen the attacking threat of Kevin Kampl coming in from a wider position and Marcel Sabizter’s ability to start an attack with time and space on the ball. The build-up to the second goal involved the ever-present Kevin Kampl and Marcelo Saracchi combining before a burst of pace from the Brazilian full-back released an accurate cross which allowed Bruma to finish a well-crafted move. Kampl’s positional change pulled two Celtic players out of position giving Saracchi a one v one opportunity to run down the wing. As is customary, the full-backs were involved in the goals with Saracchi using his incredible pace to create the goal. The use of full backs has always been a key contributing factor to Leipzig and Red Bull’s success. Whether it is Stefan Lainer, Lukas Klostermann or Marcelo Saracchi, the full backs are instructed to make attacking contributions. Will there be redemption at Celtic Park? The Scottish champions played valiantly for 30 minutes before succumbing to a patient Leipzig team who absorbed pressure and scored after a few tactical changes from the manager. Another attempt of playing with a low block from Brendan Rodgers was foiled but injuries have limited the ex-Liverpool manager’s selection. The doubleheader has been deemed an effective fight for second place with FC Salzburg already beating both RB Leipzig and Celtic FC in their first two games. With one win over Rosenborg in their doubleheader, both teams will expect the Austrian champions to comfortably top the group. Rodgers will need a strong performance from his side when the East German club visit Celtic Park in two weeks’ time to stand a chance in qualifying for the knockout stages of the Europa League.